Type location Za飏e (Wheeler, 1922: 265, illustrated, worker); worker only described (Bolton, 1973b) - no type images on Antweb (June 2018) . WORKER - TL somewhat less than 6 mm. Head longer than broad, subelliptical, not broader behind than in front, narrowed behind the eyes to the occipital border, which is indistinctly marginate, very convex in the middle above through the frontal carina), the cheeks rather straight, the gular margin bluntly submarginate. Eyes at the middle of the sides of the head, large, prominent, broadly elliptical, their external orbits slightly sinuate. 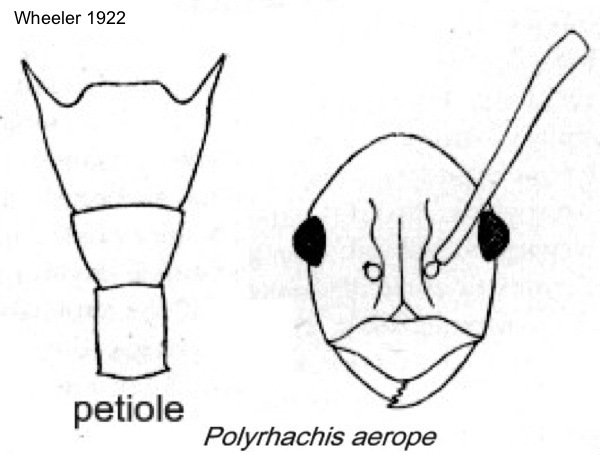 Mandibles narrow, their apical borders rather oblique, with five subequal teeth. Clypeus convex, bluntly carinate in the middle, its anterior border broadly rounded, entire. Frontal area broadly triangular, indistinct; frontal carinae high, rather closely approximated, moderately sinuate, somewhat farther apart and subparallel behind. Antennae long, scapes slightly enlarged and deflected at their tips, extending fully one-half their length beyond the posterior border of the head. Thorax much like that of P. concava, long and narrow, the dorsal surface concave with strong, upturned lateral carinae, notched at the pronounced, transverse promesonotal and metanotal sutures. Pronotum as long as broad, narrowed behind, its anterior spines straight, acute, slightly divergent, flattened, more than twice as long as their width at the base. Mesonotum trapezoidal like the pronotum, but smaller and broader than long; base of propodeum regularly rectangular, one and one-third times as long as broad, its posterior corners with two small, erect, slightly recurved teeth, which are as long as broad at their bases, its posterior border not marginate but, as with concava, passing over into the sloping declivity, which is slightly longer than the base and feebly convex in profile. Petiole and gaster shaped as in concava, but with the median pair of spines of the former straight, when seen from the front, and not slightly curved inward. Tibiae distinctly constricted at their bases. Shining; gaster smooth and polished. Mandibles finely striated and sparsely and finely punctate; head, thorax, and petiole finely coriaceous or shagreened; the clypeus somewhat smoother. Gaster very minutely and superficially punctate. Colour black, palpi and antennal insertions reddish (Bolton, 1973b: 296, not illustrated). Although, as Bolton commented, this appears very close to Polyrhachis concava, the specimen below has a more slender alitrunk, both viewed from above and laterally. It also is noticeably smoother and shinier. See also https://www.antweb.org/specimenImages.do?code=casent0281441 from Cameroun. The photomontage is of a worker from Cameroun; Awae II; collector A Fotso Kuate (fk polyrhachis sp7).